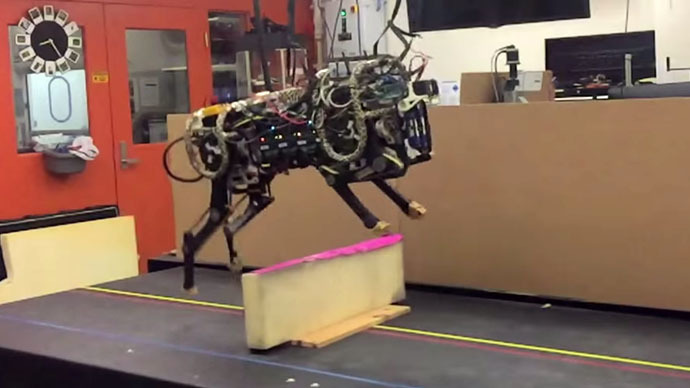 A team from the Massachusetts Institute of Technology (MIT) has developed a four legged robot called Cheetah 2 which can see and jump over obstacles like a hurdle runner using an on-board laser devise. The robotic cheetah in inspired by a built in tool called LIDAR, a visual system that uses reflections from a laser to map terrain. The robot was first tested on a treadmill and was able to jump objects up to 45cm tall while running at a speed to 8km per hour. It estimates an object’s height and distance, then gauges the best position from which to jump, adjusts its stride to land just short of the obstacle and finally exerts enough forces to get itself over. It was then tested on indoor track where it managed to hurdle 90 percent of obstacles successfully. "A running jump is a truly dynamic behavior. You have to manage balance and energy, and be able to handle impact after landing. Our robot is specifically designed for those highly dynamic behaviors," Assistant professor Sangbae Kim said. Kim explains in a MIT blog that the algorithm doesn’t provide an optimal decision but rather a feasible one. “If you want to optimize for, say, energy efficiency, you would want the robot to barely clear the obstacle — but that’s dangerous, and finding a truly optimal solution would take a lot of computing time. In running, we don’t want to spend a lot of time to find a better solution. We just want one that’s feasible. We’re too obsessed with optimal solutions. This is one example where you just have to be good enough, because you’re running, and have to make a decision very quickly,” Kim said. Kim and his team are now adapting the robot cat so it can handle softer grassy terrain. The MIT researchers first revealed their creation at the IEEE/RSJ International Conference on Intelligent Robots and Systems last year in Chicago. If jumping is taken out of the equation, then the robot can manage to run up to 48 km an hour – faster than Usain Bolt. The cat’s secret lies in a bounding algorithm developed by MIT and which is programmed into the robot’s legs. Just like a professional sprinter it exerts a certain amount of force when it hits the ground in order to maintain a given speed.